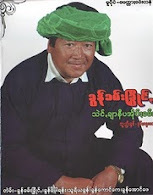 Taunggyi Time (ေတာင္ႀကီးတုိင္းမ္): Is Burma Pursuing A Nuclear Program? Evidence is surfacing that suggests that Burma, also known as Myanmar, may be pursuing a nuclear weapons program. Along with recent reports from defectors saying that the pariah regime is building a nuclear reactor and plutonium extraction facility in the North, a new photo of a mysterious and enormous building has been posted online. Jeffery Lewis of the New America Foundation posted the image on his blog, Arms Control Wonk, and the Institute for Science and International Security (Isis) used the image in a report published on Monday. Obtained via Google Earth, it shows an "anomalous building buried in the ground north-east of Maymyo." Although the Isis report says that it cannot "ascribe [the buildings] with obvious nuclear industrial characteristics," it also notes that Burma has carried out suspicious transactions with North Korean companies, including the aquisition of "extremely high precision equipment." The building, which looks like a huge swimming pool, is approximately 80 meters (262 feet) on each side. Lewis notes that it is in a remote, mountainous area and there seems to be a power transmission line attached to it. The Naypyidaw regime of Burma has known connections to North Korea and is guilty of many human rights abuses, but both the Bush and Obama administrations have been fairly quiet on speculations of its nuclear weapons program. Clinton did address the issue briefly at July's ASEAN summit meeting, saying "We know there are also growing concerns about military co-operation between North Korea and Burma, which we take very seriously." 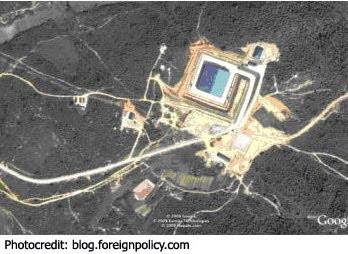 The secret complex, much of it in caves tunnelled into a mountain at Naung Laing in northern Burma, runs parallel to a civilian reactor being built at another site by Russia that both the Russians and Burmese say will be put under international safeguards. Burma expert Andrew Seith cautions that Burma's suspected nuclear program is "still the subject of considerable debate among scholars and officials," but agrees with many bloggers that the evidence against the Naypyidaw regime is mounting, and says there may be growing concern about the issue in the Obama administration. The reports from ISIS are inconclusive, but the recently published image adds to the growing evidence of Burma's pursuit of a nuclear program that is certain to make the U.S. and Burma's neighbors anxious.